I love pizza. It may in fact be my favorite food, but that is up for some serious debate. 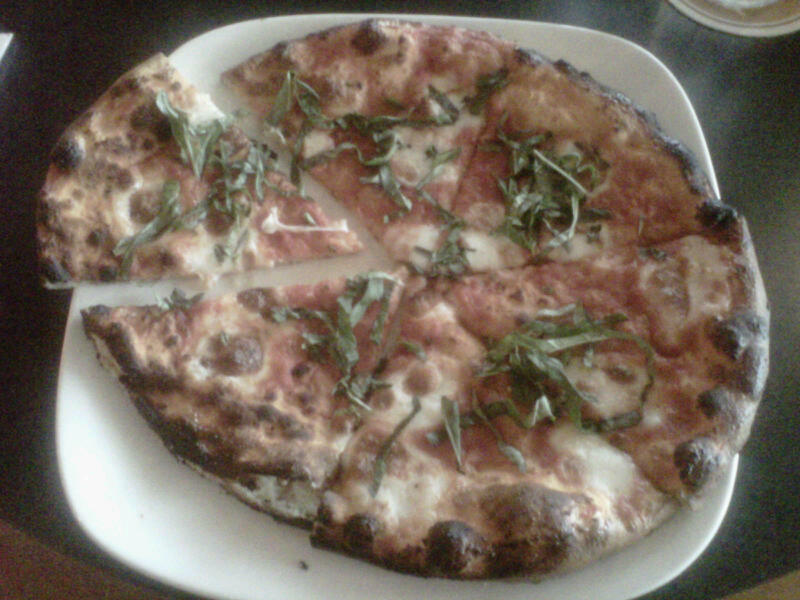 Earls was the lunch spot today and a nice, light Naples Margherita pizza looked to be the perfect food for a hot, humid day. Made with 5 basic ingredients, a Margherita pizza is a classic as it gets. Fresh mozzarella, home-made tomato sauce, basil, olive oil and a hand tossed crust that is light and thin, so good. Earls has really done this iconic Italian classic justice, with just the right amount of every ingredient, a tomato sauce that has a fresh taste with just the right amount of shredded fresh basil and mozzarella. The picture is a poor representation but that’s what you get from a phone camera with no flash in an uncomfortably romantic room (speaking as someone eating with a coworker named Jeff…not that there’s anything wrong with that…). So how much do I like pizza? When I got home from work Lyndsey asked me if I wanted to order pizza for dinner…I said yes. It’s not weird, don’t say those things about me!!! Besides it was still hot and gross outside and the last thing I wanted to do was cook. speaking of cooking I was thinking about doing a couple of posts with some of my favorite recipes, what do you guys think? Anyways, back to my pizza love fest. There is a little family run pizza place up the road that shall remain nameless. It’s super cheap and not half bad, I’m not telling you their name because I think they’re running a sweat shop by having their kids run the place, 8 year olds make good pizza but their cutting skills need a little work, 2 huge pieces and 6 tiny ones. Thank you to Earls for turning around my little streak of negativity, which didn’t go unnoticed judging from some recent comments (I’ll let you find it). I promise that I will always tell it like it is and I won’t let bad food slide just to have a happy blog. Good food is what I’m after and when bad food shows up it’s not acceptable. I’m headed downtown this weekend for some street food action and a tour of Vancouver’s latest and greatest mobile gourmet kitchen and I can’t wait. Have a great Friday!!! Roaming Dragon, Pan Asian Street Food. If you’re looking for pizza theres a pizza truck up a block from the Elephant and Castle downtown that seems to have just showed up last week. I guess thats the gourmet kitchen you’re checking out? I’ll have to check that one out too! The one I’m going to this weekend is a Pan Asian style food truck called the Roaming Dragon. It looks really good and steamed pork buns rule. The recipe idea is good. I have a great bread machine pizza dough one.